While reading the book Inner Christianity by Richard Smoley, I began reading the section entitled The Feminine Face of God and came across the section which dealt with “The Divine Sophia.” This seemed extremely appropriate for me as I was recently reading information regarding the concept of being a “Sophian” and exploring more the concept of Christopaganism in general. I found a great deal of interesting information within that section that not only piqued my interest, but also resonated with me on a higher level. And so, I will share some of that information here. “The Lord possessed me in the beginning of this way, before his works of old. I was set up from everlasting, from the beginning or ever the earth was. When there were no depths I was brought forth; when there were no fountains abounding with water…. When he prepared the heavens I was there; when he set a compass on the face of the depth; when he established the clouds above; when he strengthened the foundations of the deep” (Prov. 8:22-24, 27-28). In this same section it is mentioned that one modern philosopher, Martin Heidegger, discusses this same notion in a lecture of his on the Greek thinker Heraclitus. Heidegger suggests that Heraclitus described this process of cognition as “picking out” and even used a term for it – logos (from the Greek legein, “to gather” or “to pick out”). Logos is usually translated as “word”, though it actually has an enormous range of other meanings as well. Smoley suggests, however, that it can be accurately described as “the word” because “consciousness goes through its experience and picks out some feature of it – an object, external or internal” and “instantly appends a name to it, a word. In this sense it is the “word” that brings the world into being.” Smoley also mentions that the ancient Hebrews held a similar philosophy at the center of their own worldview (that the name for a thing was identical to the thing itself) with the phrase, “God and his name are one.” The term logos was brought into the Christian tradition through the Gospel of John where it reads that through the Word “all things were made… and without him was not any thing made that was made” (John 1:3). 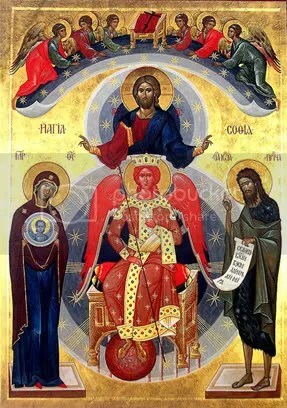 However, while the Word is usually considered to be masculine (logos being masculine in Greek) and Sophia to be feminine, the earliest traditions saw the two as having an extremely close connection; that is, Sophia and Christ (the Logos) could be seen as essentially the same principle. It was when I read this that I had to go back and re-read it. The idea that this female personification and this male counterpart could in fact be one and the same grabbed my attention and wouldn’t let it go. And then, I began to think: If Sophia is seen as a personification of Divine Wisdom and Christ can be seen as the Divine Word, then could they not then both be abstractions? Or could Sophia be the Divine Feminine to the Divine Masculine of Christ? As in, are they both Divine energies/deities that exist on some level and are but two sides to one coin? I can get down more easily with an allegorical Jesus/Sophia combination as it jives with my existing belief in a universal deity that is neither masculine nor feminine, but rather a combination of the two and neither one all at the same time (it’s non-corporeal after all, and therefore has no true sexual identity). I’ve been uncomfortable with calling God “Him” and “He” for a long time now, so the suggestion of God being perceived as possessing both male and female energy within a Christian tradition is a nice thing to see. It also makes me more comfortable with the concept of Jesus not as a literal half-God half-man being, but rather a spiritual metaphor that we are all meant to learn from. To me, it seems that the “salvation” he is purported to bring is really meant to show us what we can all achieve when we become re-united with the almighty Creator/Divine. His resurrection reads to me as a parable for how we can all achieve enlightenment and oneness with the Divine, even while still in our physical bodies. Was he not said to have ascended bodily into heaven? Which of course is one of the things that has always bugged me: If Jesus had truly been dead then what would he need a physical body for in a spiritual realm? I don’t believe that the man called Jesus in the Bible was the physical incarnation of God or that through the death of His son/material self (if you believe in the Trinity) that through that act alone all of humanity has been somehow “saved” from something else. The crucifixion I see as an allegory of the end of a spiritual journey and the ultimate sacrifice of one’s physicality and focus on the material to be freed from it to attain union with the Divine. That is my opinion. The stories in the Bible don’t have to be interpreted literally for them to have meaning. The majority of the planet accepts these stories as literal truth because they’ve been taught to and for no other reason but that they’ve been told to. I think there’s a lot more to Christianity than meets the eye and it is that esoteric side of it which not only interests me more, but also comes across as being the most spiritual, containing the most truth, and holding the most meaning. I need to be able to feel that there is a Divine presence somewhere or in something not just be told that I’m feeling it. If something doesn’t feel right and doesn’t make sense to me than I can’t accept it as a truth. I’ve felt and experienced the spiritual side of life and I know that spiritual side is a reality, despite what the jaded and the cynical would rather believe. As Nick Cave says in one of my favorite songs of his (Into My Arms), “I don’t believe in an interventionist God”, and really I have a hard time understanding how anyone can. But that doesn’t stop me from believing in God, whatever the Divine really is, and seeking It out. I feel that my life will be a continuous search for the Divine in my every day life and a life-long pursuit of spiritual truth. And that’s just fine.